Londoners - like most folk - love their chocolate, which is lucky because the capital really does feature some of the best chocolates shops in the world. Exquisitely crafted, lovingly made, these lip-smacking boutiques are a cocoa-bean lover's Valhalla. Enjoy. Highly-acclaimed choc shop with freshly prepared, uniquely flavoured treats. Ever tried lapsang souchong flavoured chocolate? How about Sichuan pepper or red wine and tobacco? If not, you probably haven't yet visited this innovative, highly revered, choc shop. Trained in Belgium (the home of chocolate), ex-pastry chef Gerard Coleman has elevated this simple, small-scale London shop to almost iconic status. While some of the flavours might seem a tad unusual, you just have to trust Coleman's expertise and judgement and dive right in. All of the chocolates are made entirely of natural ingredients (one of which is large quantities of sugar) and have to be consumed within two weeks - no nasty additives or preservatives here. While there's no point singling one particular flavour out for special attention - every one of these hand-made delicacies is a real tongue-tingling delight - most customers become instantly addicted to a favourite combination that demands regular return visits. There are four branches of Artistan du Chocolat in London: in Chelsea, on High Street Kensington, in West Hampstead and Notting Hill as well as a concession in Selfridges. Royal-warrant-holding chocolatier with 130-year history. In 1875, at the behest of Edward VII, Mme Charbonnel quit her post at Parisian chocolatier Maison Boissier to set up a fine confectionary house in London with Mrs Walker. The result has been 130 years of the finest chocolate in traditional French style. This long-established chocolatier is now the holder of a royal warrant. In spite of the shop's continental origins, the goodies feel very English and traditional, as you would expect from their location on Old Bond Street and reputation. Their gift boxes are among the best-known upmarket gifts in the world. Visit Charbonnel et Walker at 1 Royal Arcade Mayfair or Cabot Place West Canary Wharf. Specialising in designs which, "are quite, quite bonkers" and all, incredibly, in chocolate. Making fantastical creations out of chocolate, Choccywoccydoodah is the place Madonna, Kylie and Boy George go to when they want something spectacular in cocoa. Choccywoccydoodah started out with a shop and bakery in Brighton and opened this branch off London's Carnaby Street in 2012, a beautiful shop where you'll find some crazy chocolate creations - everything from a cat riding a bicycle to a pheasant on a rugby ball. Specialising in designs which, "are quite, quite bonkers", according to boss and chief chocolatier Christine Taylor, Choccywoccydoodah creations have featured in Tim Burton's Charlie And The Chocolate Factory and their clients include Kylie Minogue, Vogue magazine and Boy George who got a pink and yellow multi-tiered creation for his 50th. Two floors above the shop is the secret room where 20 to 30 guests can book in for slices of cake, ice creams and a sweet buffet - two hours of pure chocolate indulgence. Beautifully presented luxury Belgian chocolates, on Chiswick's Turnham Green Terrace. For beautifully presented luxury Belgian chocolates, made to centuries-old family recipes, head to the perfectly chilled L'appetit fou chocolate shop on Turnham Green Terrace - kept to a cool 18 degrees centigrade to prevent the chocolates melting. Owned by Edward Cloet, who grew up in Belgium but now lives in London, L'appetit fou specialises in decadent chocolates sold by the slab, bar and bite, in a shop decorated with overhanging bowler hats and a Magritte pipe. You can choose your own box of pralines from the neatly regimented lines of chocolates - available in unusual flavours like rhubarb, citron and speculoos (almond praline with spiced biscuit pieces). Belgians will be pleased to find their favouite sweet, the cone-shaped Cuberdon candies, which have a long history dating back to the late 19th century. The sweets - known as the "Ghent nose" after the Belgian city where they were invented - have a firm crust on the outside and are gooey and fruity in the middle. Originally available in raspberry, they come now in over 20 flavours. A wonderful addition to the independent shops on Turnham Green Terrace. Single origin chocolate and flavoured ganaches are beautifully displayed at this exquisite chocolate shop. For Valentine's Day 2019, Pierre Tachon and the team at Le Chocolat Alain Ducasse launch a stunning gourmet chocolate heart. Made with single origin chocolate and ganaches, the heart comes in two halves: one side is coated with dark chocolate and filled with an almond praline; the other is a combination of milk chocolate and hazelnut praline. The gourmet heart is just one of the many delicious single-origin and flavoured ganaches on offer at Le Chocolat Alain Ducasse, the stunning chocolate shop found under the arches of the Heatherwick Studio-designed Coal Drops Yard district in King's Cross. A visit is a sensory treat. A generous selection of posh chocs in one of London's best department stores. As you would imagine from this plush store, Liberty's Chocolate Shop is full of the most exclusive brands, lining the shelves in row after row of almost too-good-to-eat chocolates. But we all know that it's as much about the packaging as it is what's inside and Liberty just screams beautiful things, right down to its chocolates. Pretty round boxes of Charbonnel et Walker truffles sit alongside Prestat's organic chocolates, wrapped in graphic, bold designs, with chocolate stilettos combining to loves in one. Liberty has also joined the Fairtrade revolution by stocking bars of Divine chocolate (in seven flavours) and with Rococo's sugar-free and dairy-free options too they really have got chocolate to suit everybody. So, if you're not sure exactly what you want then Liberty's Chocolate Shop is the perfect place to browse and be inspired by posh chocs. Organic truffles, melted chocolate shots and marbled slabs are among the tempting options here. Regular tastings, an on-site, open-view kitchen, highly skilled master chocolatier Chika Watanabe and some of the best chocs in town make Melt a mouth-watering option when it comes to confectionary. Stand and drool as organic truffles, melted chocolate shots and spiced, crispy orange discs are rustled up on cool white marble slabs in full view of customers. Children's Hour offers youngsters the chance to get sticky making their own unique range of chocolate treats. Sleek packaging, cool surrounds and top-quality service complete the picture. Melt chocolate boutiques are found in Notting Hill and Holland Park and they also have a concession at Selfridges. Willy Wonka would be proud of the unique creations at this store. Most folk love to indulge in chocolate but Montezuma's with its range of Willy Wonka chocolate factory-esque goodies is for 100%, unadulterated, slightly obsessed lovers of the stuff. There's a fabulous, funky assortment of organic Chunky bars - try the milk-and-orange Space Hopper, white, chilli and ginger Culture Shock or the dark-and-pistachio Vera, made with award-winning chocolate. Or, go for a Choco:Block, big chunks of chocolate with other ingredients like honeyed banana chips or real coffee thrown in - to really splash out there are Gallon Jars full of assorted chunks. The shop also offer more understated, sleek designs for a touch of class but - whatever you go for - the chocolate will be delicious! Before he was a full-time chocolatier, Paul A Young was patissier for Marco Pierre White. The drama and perfectionism demanded by a Michelin-starred restaurant are both apparent in the exquisite chocolates and desserts produced by his Islington shop. The more impressive are finished at the counter in front of customers, while the smaller sweets and chocolates are jewel-like in their perfection. Young's haute cuisine background - he's a Gold Award-winner at the World Chocolate Awards - means there are plenty of weird and wonderful flavours available, but above all this is a shop that is about freshly made, thoroughly indulgent, luxury chocolates and puddings. Closed Mondays for chocolate workshop day. Paul A Young chocolate shops on Wardour Street and at The Royal Exchange have been added to the Camden Passage original. Serious chocolate-lovers head down to Philip Neal's delightful Chiswick boutique. Serious chocolate-lovers avoid the chocolatiers of Mayfair and their exquisitely designed jewel-like sweeties and head down to Philip Neal's delightful Chiswick boutique (formerly known as Theobroma Cacao). This is chocolate for purists, each piece clearly hand-moulded, with the rough edges that show a true artisan at work. They are also so rich in cocoa that it dusts your hands as you eat, hanging in the air to give the small premises a heady, sultry atmosphere. 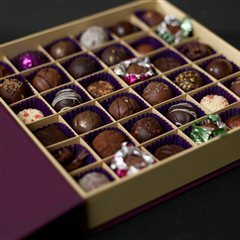 There are plenty of posh options - the wedding collection includes shoes sculpted out of chocolate - if you need a gift to impress somebody, but for sheer chocolate deliciousness you simply can't beat the big baskets of roughly-cut dark and milk chocolate that dominate the shop. Celebrated chef patissier Pierre Hermé, known as the 'Picasso of Pastry', sells his delicious macarons and chocolates at Selfridges, and at two stand alone shops in Knightsbridge and on Monmouth Street, Covent Garden. The shops are a must-visit destination for anyone with a sweet tooth and a rather large wallet. As well as Hermé's famous macarons, the shop stocks his unique chocolate collections, including bonbons, truffles, Absolument Chocolat batons, pound cakes and the latest fad, the indulgent one-bite wonders PH Cubes. But it's the macarons which should draw in the crowds to this fittingly slick and contemporarily designed shop. Hermé is praised for his unusual and exotic flavour combinations such as olive oil and vanilla, strawberry and wasabi, milk chocolate with passion fruit, Venezuelan chocolate and apricot, rose and pistachio. A mouthful of colourful decadence, Hermé's macarons are refreshingly different from the celebrated sweet and pastel-coloured treats from Laduree. Winner of the Prix du Monde, Pierre Marcolini is one of the finest chocolatiers in the world. Winner of the Prix du Monde, Pierre Marcolini is one of the finest chocolatiers in the world. Proud to be "the only chocolatier in Belgium who creates products by roasting his own beans" according to the Daily Telegraph, "he visits his bean suppliers once or twice a year and knows all the farmers by their first names". 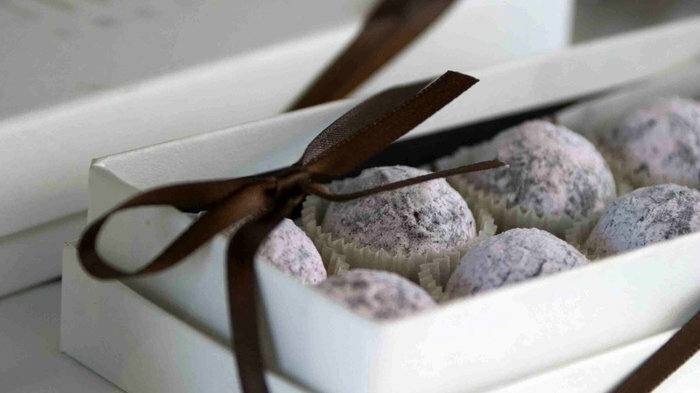 As a result, his layered truffles and home-made pralines are the finest available in the capital. Marcolini started with "the simplest of ideas: to make smaller chocolates, with new tastes of flowers, spices, fruits, and less sugar", he revealed to the Telegraph. Many artisan chocolatiers - including Artisan du Chocolat founder Gerard Coleman who worked with Marcolini - have followed in his footsteps. A grand chocolate company that has found a fan in Her Majesty the Queen. With Roald Dahl and Her Majesty counted as just a couple of their biggest fans, this brightly-coloured, richly scented, teeny tiny chocolate shop tucked away in a corner of the Princes Arcade belies its significant status and reach. Prestat is one of the world's oldest and grandest chocolate companies. Founded in 1902 by French émigré, Monsieur Antoine Dufour (a former chocolatier to Napoleon III who stole the recipes from the French Court), Prestat's iconic gilt-embossed packaging continues to offer a striking visual reminder of its royal connections both past and present (Prestat are the official Purveyors of Fine Chocolates to the Queen). Famous favourites include vanilla ganache, marzipan, chocolate-dipped apricots and their world famous truffles. Chocolate boxes filled with truffles and caramels, florentines and shortbreads are beautifully packaged in white and red boxes. Chocolate boxes filled with truffles and caramels, florentines and shortbreads are beautifully packaged in white and red boxes at R Chocolates London, the posh chocolate shop on Belgravia's Ebury Street. Founded by self-confessed chocoholic Sir Evelyn de Rothschild, producer Jessica de Rothschild and Ben Elliot (co-founder of Quintessentially), chocolate is sourced from award-winning chocolate makers, Original Beans. This is chocolate couverture at its finest. They even do a chocolate sparkling wine, made from Chardonnay grapes and extracts of cacao and hazelnuts. Here you can also enjoy a luxurious Afternoon Tea in The Belgravia Tea Room and stop by the Dessert Bar for a chocolate making masterclass - learn how to make truffles, personalised caramels or patisseries. Advocates of organic, fairly-traded cocoa and pure blend of chocolate. This gorgeous shop is a mecca for chocolate lovers. It is the brainchild of designer Chantal Coady, who opened the store in 1983, and is dedicated to producing the finest and funkiest chocolate in the capital. Chocolate becomes an art form at Rococo. Famed for its unique blend of organic chocolate, made using cocoa beans from the Caribbean, they add extra cocoa butter to ensure that distinctive melt in the mouth feel. There are five branches of Rococo in London, all in chi-chi shopping areas - Covent Garden, Chelsea, Notting Hill, Marylebone and Belgravia. 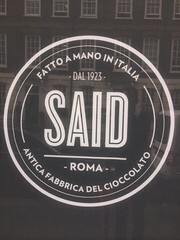 Italian chocolate shop SAID was founded in Rome in 1923 and made its way to London 90 years later. A beacon for Italians in London, Italian chocolate shop SAID was founded in Rome in 1923 and made its way to London 90 years later opening its first London boutique, located in the heart of Soho, in 2013. It's a gorgeous little spot where the walls are covered in silver chocolate molds of all shapes and sizes - stars, shells, rabbits, fish and Easter eggs - and a fire is lit on cold, wintery days. The counter displays large glass jars filled with white, milk and dark chocolate on one side with and a range of hand made truffles on the other. The hot chocolates are certainly worth making a detour for. Kept warm in large glass containers on the back counter, stirred and heated continuously, the traditional Italian dark hot chocolate is rich and dense like a chocolate pudding. But there's chocolate in every form and shape here and the hand crafted chocolates and truffles make for a very indulgent treat while the romantic dim lighting and the roaring fire provide a warm, Italian welcome. You can find SAID in Soho and Fitzrovia. The Chocolate Library features 400 chocolate bars, arranged A to Z, and comes with a 'Chocarian' to guide you. The chocolate department within the famous Selfridges Food Hall, larder of London's Selfridges department store, is home to a 'Chocolate Library' featuring over 400 alphabetically arranged chocolate bars - listed by the name of maker, from Adoré to Zaabar. Newly opened in 2014 in Selfridges' refurbished and expanded Confectionary Hall, the library comes complete with a Chocarian to guide you through the beautifully laid out assorted bars. Brands include bean to bar makers Willies Cacao who not only produce quality chocolate but who also own the plantation, and single origin, limited edition chocolate by Criollo. There's no end of interesting flavours to try - almond and orange peel, lemongrass, green grape and, for the really adventurous, black olive and peppercorn. 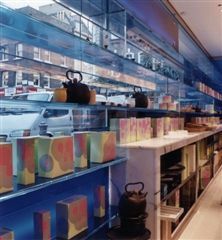 Hiding behind the electric blue glass front is a small but perfectly formed chocolate counter. Not exactly a choclate shop, Yauatcha is the Michelin-starred tearoom and dim sum restaurant originally set up by Alan Yau. It doesn't shout about it but hiding behind the electric blue glass front is a small chocolate counter where you can find the most amazing chocolates which come beautifully packaged parcels. At the end of the long patisserie counter at the front is a range of chocolates made in-house with Valrhona chocolate. Available by weight or in pretty boxes, these are some of the cheapest fresh chocolates made with high quality to chocolate you'll find anywhere in London. Chocolate comes in delicious flavours like salted caramel with whole hazelnut and praline and cherry making this one of the few Michelin starred restaurants where you can take away. From cheap budget hotels to luxury 5 star hotels see our deals for hotels, including Radisson Blu Edwardian Mercer Street from 55% off.